The late 1800's Faultless-Malleable cook stove originally fueled by wood, continues to serve the home. Grandma Tillie's pride and joy was restored to it's original gleam. The cook top has been converted to a Jen-Air electric smooth top for your convenience. A conventional/convection wall oven, microwave, in unit coffee service, and full sized refrigerator with ice-maker are amenities those who know their way around a kitchen will appreciate. Hiding under the 13 layers of wall paper( with the first layer being the Abend-Pfosten a German daily newspaper from Chicago) were the skillfully hand-hewn white cedar logs. Mortar made from lime processed in the farm's' kiln served as chinking in three walls, with the east wall being originally chinked in clay and straw. The logs, now exposed lend a warmth and coziness you will not soon forget. Rustic furniture constructed from lumber reclaimed during the restoration project compliment new and original pieces in the home. 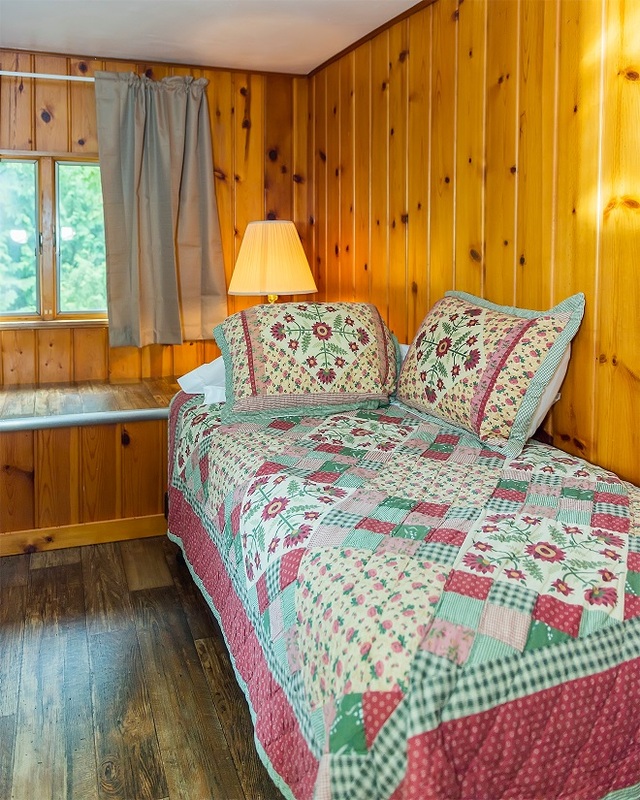 The open beam and board construction coupled with star filled skies of our country nights and comfortable sleeping accommodations will leave you with no need to count sheep to get to sleep!. 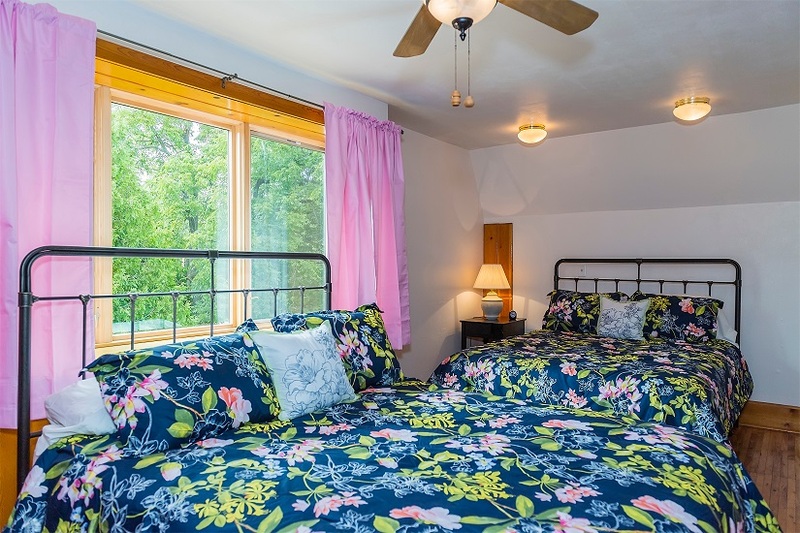 The west bedroom features a queen bed and the east bedroom has two twin beds. A premium queen futon is located in the living room. We supply all bed, bath and kitchen linens. 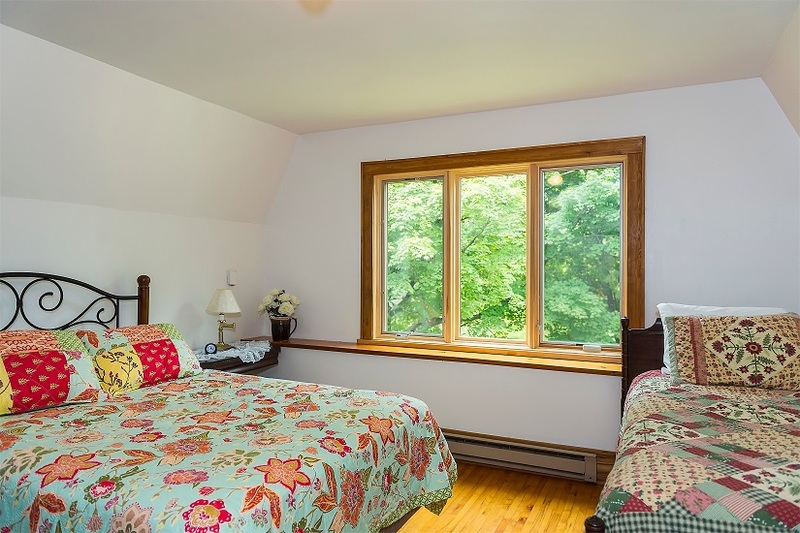 Both bedrooms feature large skylights for night time star gazing. Where once a large wood burning heater stood, now stands the Vermont Majestic 360 gas fireplace. Enjoy it after hiking, bicycling, snowmobiling or a cross country ski through our wooded trails Give the trails at Newport or Peninsula State Parks a try - they're nearby. Bring your snowmobiles or bikes. The Door County bike trails are just 1/4 mile away, and the State of Wisconsin Snowmobile trail system traverses the estate. Satellite TV and a DVD player are modern conveniences we did not forget. The openness of the kitchen and living areas are perfect for entertaining your family and guests. Consider Gustave's Getaway when making holiday entertaining plans and vacations. A picnic area including an outdoor table, benches, charcoal park grill and fire pit are just out the kitchen door. Perfect for your outdoor entertaining or enjoying Smore's while viewing the sunset with family and friends. The upstairs area of the home converted to bedrooms, once housed the farm's granary. Scotch Peas, a cash crop, was stored there while great-grandpa Robert's family of 10 lived downstairs. Two inch diameter dowels pinned vertically through the upstairs knee wall logs were discovered during the renovation. These dowels lent additional support to the walls given the weight of the grain stored upstairs. A separate granary building was eventually built, and grandpa Gust's 7 children used the upstairs for sleeping as did subsequent generations. 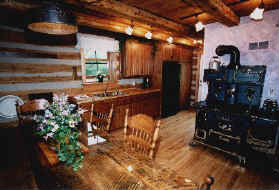 This Door County log cabin was occupied by Gust and Tille until the mid-80's, then sat vacant except for storage till it's renovation in 2006. The home originally had 20 amp electric service (1938), a cold water faucet indoors (1955) and utilized a two-holer outhouse. 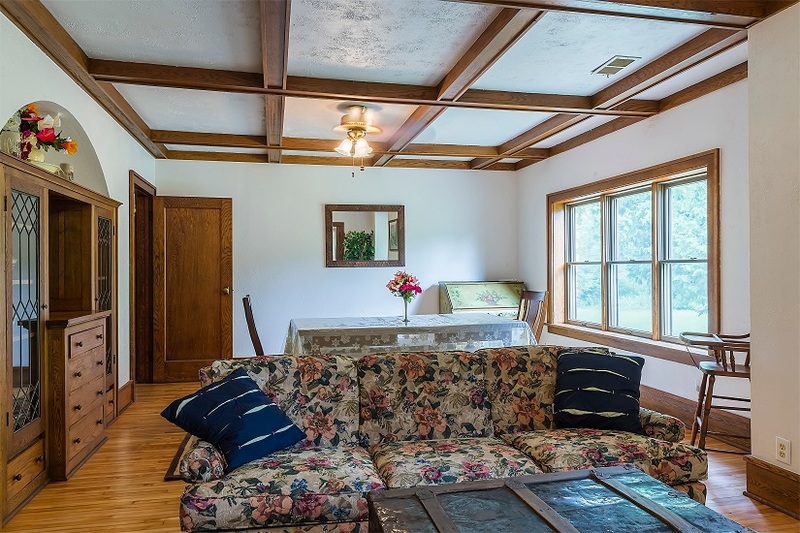 While roughing it was a way of life in days gone by, we are sure our guests will enjoy the modern conveniences the restoration and renovation project has brought to this old house. We sincerely hope you enjoy your stay in this unique piece of Door County history. A view from the dining room and living room looking east towards the bathrooms and main house bedrooms features, a 50" HD television, satellite TV, gas fireplace, and handcrafted rustic furniture. The dining room table has extensions and seats 10 comfortably. WiFi is available throughout the home. The dining room and kitchen area have handcrafted original cabinetry that was restored back to its original Southern Pine finish after having spent several decades under paint. 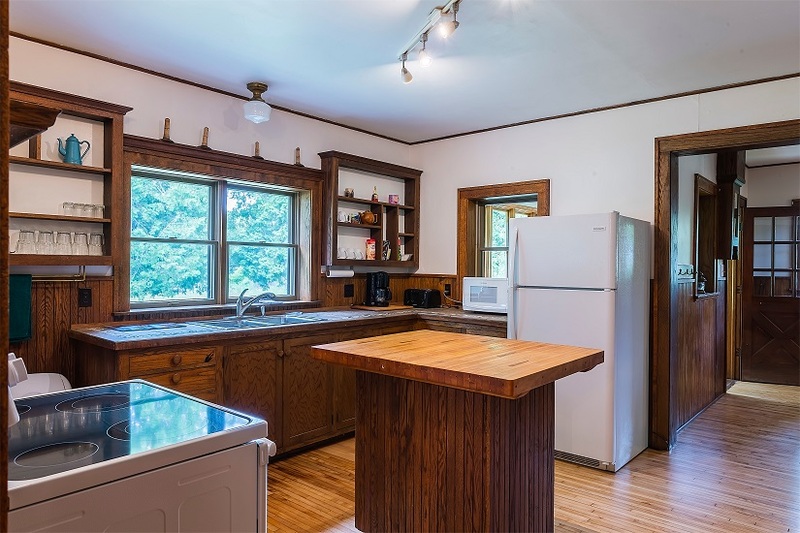 All new appliances, table service for 12, all kitchen utensils and cookware with a great view of the sugar maple woods, wildlife and 1800’s farm buildings round out the amenities. 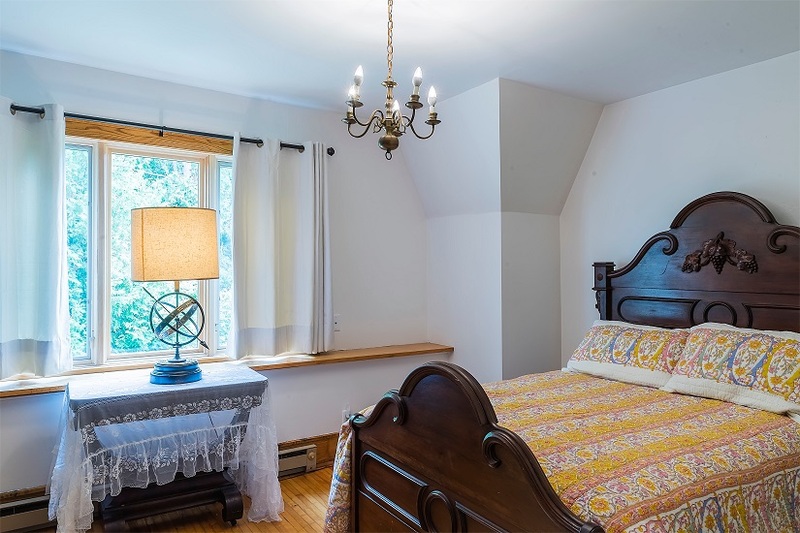 The east bedroom has one queen bed, a handcrafted antique wood writing table and chairs. It overlooks fields of wildflowers, 1800’s farm buildings who have been the subject of many artists and photographers, and some of the best fall colors in northern Door County. The south bedroom features two queen beds, antique wood writing table featuring wood re-purposed from our farm. The view is of fields of wildflowers, old growth sugar maple trees and wildlife that make the area their home. The west bedroom is extremely spacious with private access either through a west door, or through the 4-season breezeway entrance. Guests desiring to leave early morning or arrive later at night will not disturb guests in the main house area. 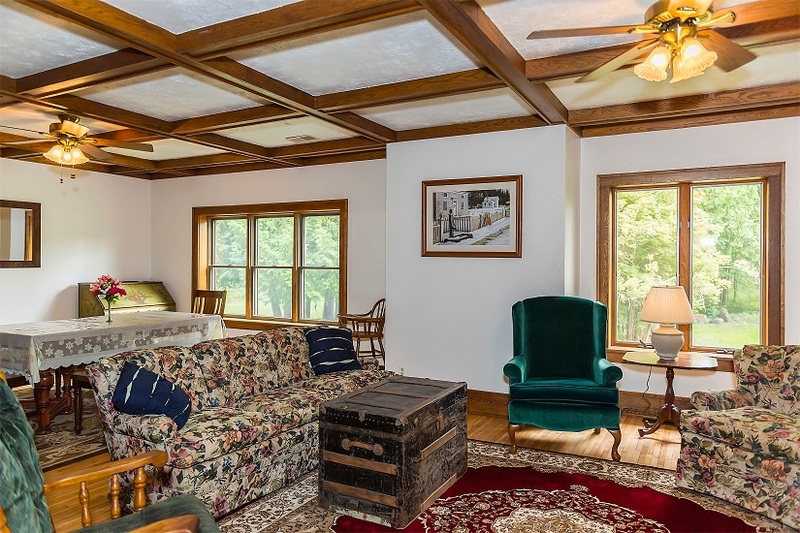 This room also has furniture handcrafted from antique wood re-purposed from our farm, folk art lamps, a seating area and 50" HD satellite television. The 400 square foot covered front porch can easily seat 10 guests. It’s a great place to view starts at night, sunrises and sets, and wildlife that call our neighborhood home. A porch swing, Adarondak chairs, patio table and chairs and end tables made of Freddie-K crates make this a great hang-out any time of the year. Access is located out the front door by the dining room or front entryway stairs from the sunny patio located to the west of the breezeway entrance to the home. Carl’s back yard has a park quality charcoal grill, picnic table and is located out the back entrance from the kitchen / breezeway area. Wildlife, large and small game are abundant here and herds of deer, flocks of turkey, and small game are common sites. The fire pit is just to the north of the picnic area and overlooks the 1800’s farm buildings, and sugar maple woods. Private recreational trails begin to the west of the fire pit area near the north end of the farm yard. Access to the State of Wisconsin snowmobile trail system and the County of door bike routes are close by. The Henson Historic Haus is located in the German Settlement area of Northern Door County. Albert Becker a skilled mason and general contractor constructed the home and large barn in 1917 to house his family. The home features an exterior constructed of local stone of the limestone strata and coral reefs of the Silurian Sea. Door County is a part of the Niagara Escarpment arc and 420 million years ago, was a submerged under the Silurian Sea. Fireplace Room: 400+ million years ago the Silurian Sea, a result of the melting of glaciers, covered great areas of land. Door County was the bed of this sea which brought about the first coral reefs and the initial appearance of the first freshwater fish. The Silurian Sea corals are the primary building blocks of the exquisite fireplace surround. It is evident that each one was selected carefully by Albert with the intent of making a showpiece that would remain a testament of his craftsmanship. 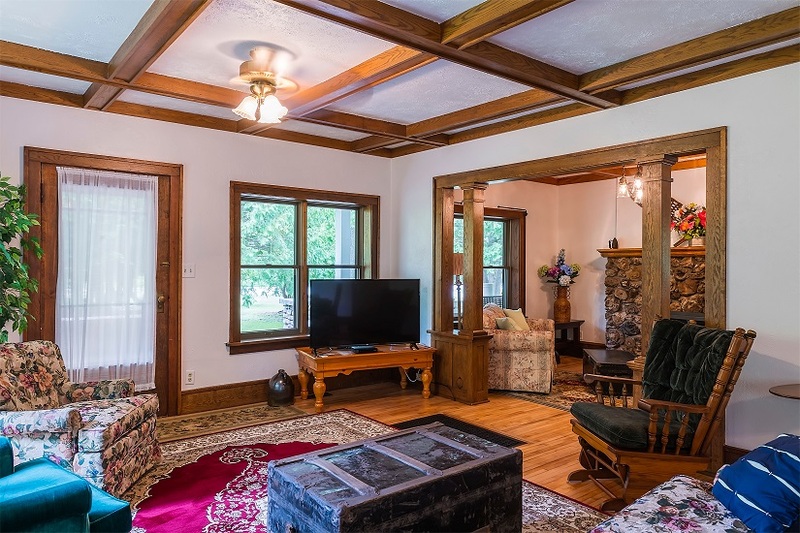 The living and dining room bring back memories of a grand era when the Becker’s contributed use of their home to host meetings for church, the Northern Door farmer’s organization, and various social functions. Handcrafted leaded glass china cabinets and surround and a dining table that seats 8-10 overlook views of the gardens. Satellite TV is an included amenity. Bathrooms: There are two full bathrooms in the home. The first floor bathroom has a “soaking tub”, and the second floor bathroom has a roomy step in shower. 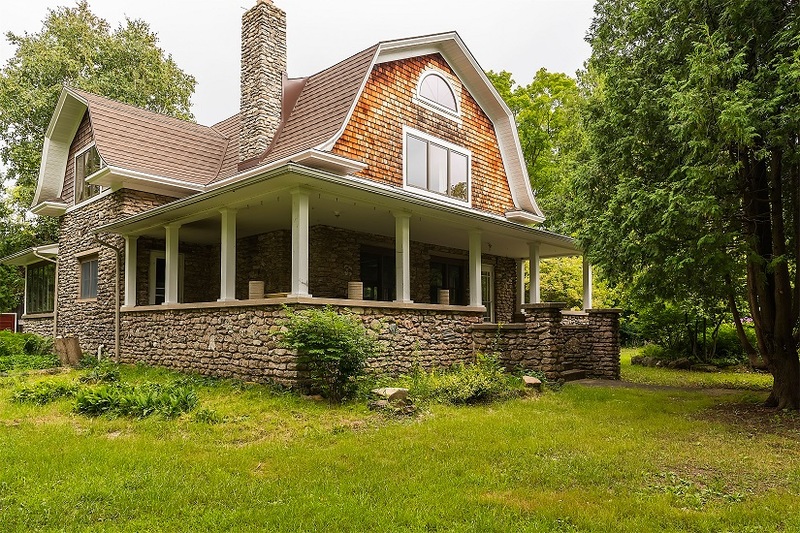 This home features handcrafted wood work and custom cabinetry of Albert Becker, local stone mason and building contractor, throughout. Much of the wood work is original. The configuration of the home changed a bit when indoor bathrooms replaced a kitchen pantry, and a small bedrooms on both floor. The kitchen now features a modern full sized stove, refrigerator with ice maker, microwave, a dining table that seats 4, and all dish wear and pots/pans. 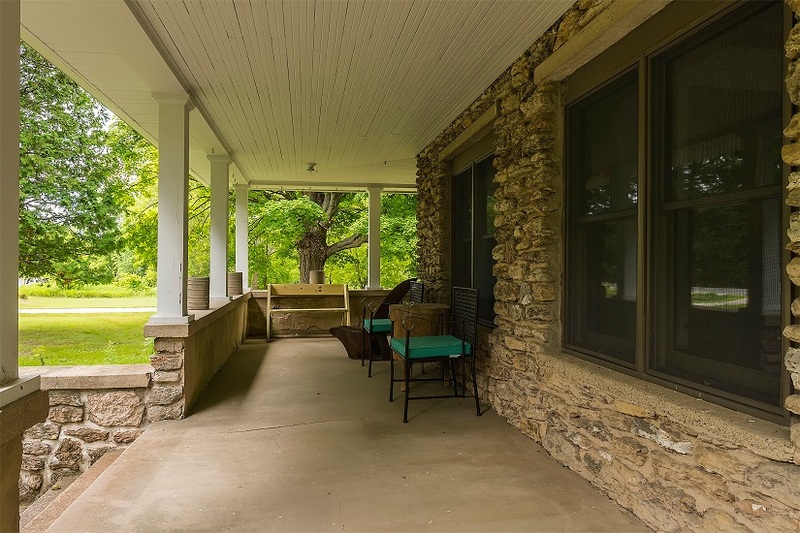 Exterior Porch: A covered porch features outdoor seating for your relaxation, and a campfire pit and benches are located on the north lawn. A cable dog run, large dog crate and bowls are provided for guests with pets in the enclosed screened rear porch of the home and adjacent yard area. Bedrooms: The bedrooms are located on the second floor and there is a bedroom that faces to each point on the compass. 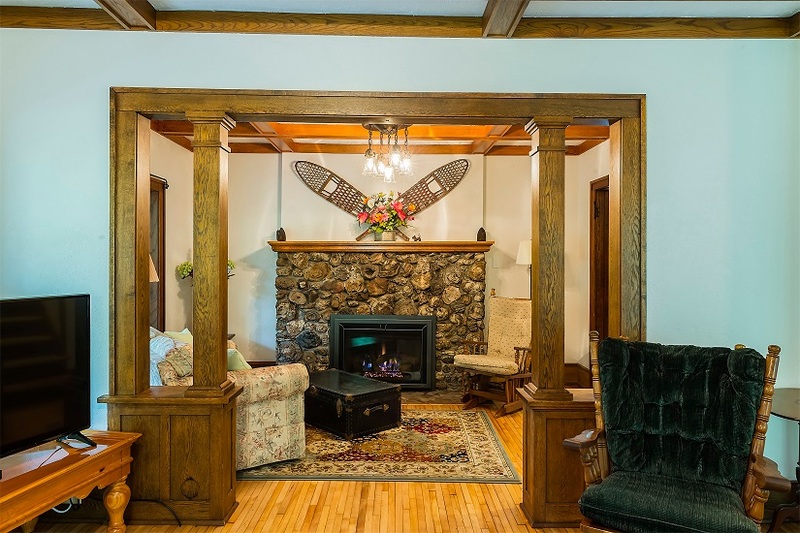 The home owner has chosen to share use of personal family antiques with guests to lend a more personal connection to the home. The Calls of the Wild at Your Doorstep! Life in the rural reaches of Door County is not without adventure and amusement. Nature abounds in the fields and forests around us. Try your hand at calling in the critters to get an up close and personal look at Wild Turkeys, Squirrels, Whitetail Deer and even the Wiley Coyote. Our office has wildlife calls for our guests to borrow and instructions on how to utilize the calls to bring the curious critters to your back yard. Feeding the animals is allowed. The Turkeys, deer, squirrels and birds that frequent the property appreciate dried cracked corn and sunflower seeds. Bones from the butcher shop bring in coyotes, large predatory and other birds and the lone Grey Wolf that sometimes howls in the dead of the night. Below is a list of birds that frequent our area either as year around residents, summer visitors, or just those on a short stop between migratory destinations. Be sure to bring your binoculars and camera for great memories. Great fun for families and nature enthusiasts.